Waitress work evokes the present. A meal is served now, minutes (if sometimes many minutes) after being ordered, and often within an hour it is eaten and paid for and its residue removed. The perception of waitressing as immediate, however, risks ignoring the deeper connections some waitresses have, in very different ways, with our common history. The Sonoran desert, the hottest in North America, spreads a scorch of earth from Baja California to Arizona. In its northern reaches, if winter rains are mighty, spring explodes with sparse lushness, in ascendancies of mesquite, yucca, bear grass, cholla, devil's claw, ocotillo, agave. The grateful people who utilized such bounty also planted seeds for squash, beans, and corn. Then they sang for summer rains, to make narrow rivers overflow onto the planted plains. If they failed to perform the rain ceremony, the Wi:gita, there would be no rains and no crops. That was the conviction. Soon the rains did come, the rivers did overflow, and crops did grow. After the harvest, the people left to spend winters by mountain streams and then returned each summer for the next song-through-harvest cycle. Their prayers, songs, and speech were in an Uto-Aztecan language that is one of the most ancient spoken vocabularies. The people themselves may have been the most ancient of southwestern aborigines. Their descendants are the Tohono O'odham. Their land, in Arizona and Mexico, totals 4,462 square miles.1 (Only the Navajo have more.) The riches end with the mileage. The Tohono O'odham Nation, boasting neither aggressive warriors nor turquoise jewelry, has a most unwarlike and uncommercial reputation, and it has not prospered in the past century. A casino south of Tucson does draw gamblers, but, except for the annual rodeo, relatively few tourists head for the main reservation ("a graveyard of good intentions")2 or auxiliary settlements. Furthermore, the land literally is not what it once was. Much was lost because the unaggressive Tohono O'odham—earlier called Papagos—indeed did not fight a great deal and thus were party to few treaties, for whatever good treaties might have done. The biggest property theft, however, was not land but water. Miners and cattle ranchers dug wells that took it away.3 The Tohono O'odham were parched into place. The tribal capital is Sells, about a one-and-a-half-hour drive southwest of Tucson. The landscape along the way opens to vistas of beige and gray, scenes that invoke the ages but do not invite stopping at dramatic, jaw-dropping overlooks. There are no dramatic, jaw-dropping overlooks. Nearing Sells, one sees roadside death sites made of crosses with plastic flowers, and then pre-fab houses, fences, and wires come into view. Then comes Sells. It is where some Tohono O'odham now spend all the seasons. On the corner of a modest crossroads, with no sidewalks and almost no traffic, is a social center: the town's sole restaurant. It is a one-story wooden building shaded by a huge tree. Inside are metal and vinyl chairs, padded pink plastic tablecloths, a television on a refrigerator, a sign that says "Do not touch t.v.—thanks." The smell of cooking oil is pervasive. The featured menu is the diet that has turned a lean people into the stricken overweight: Indian fry bread, hamburgers, French fries, a scattering of meaty Mexican dishes. After centuries of singing down the rains, of cyclical certainty, of self-sufficiency aligned with nature, the Tohono O'odham must be chagrined that there even is a Papago Cafe, or so thinks this outsider. One insider, a waitress, feels differently. Things are looking up. She has a job at last. It is well after the lunch rush and slowing down. Slow is how Arleen Dora Garcia likes it. Rushing puts her off her pace. Her normal pace, notable as she walks from table to table, is a measured glide. Her back is straight, her face impassive. She could be the sister of the model on the so-called Indian head nickel, with sturdy features through forehead, cheeks, nose, chin. She has dark eyes and skin and shoulder-length black hair. She is forty years old, plainly dressed for work in a white blouse, pants, and sneakers, and wears no adornment of any kind. When the tables empty for a while, Arleen sits at a sunny window to talk, her posture remaining the kind children are enjoined to emulate. Although semi-off duty, she is on the alert for door openings: customers in the front, the owner in the back. When I asked her for a self-description, she hesitated. "I'm just an ordinary person," she said. "Being a Tohono O'odham, I guess you'd say. Grandmother." Does she call herself an Indian or a Native American? "Either way. Native American." No preference? "We used to [be] called Papago, but now we're Tohono O'odhams." Preference? The latter. She has always used it, along with a shorthand version, referring, for example, to the casino "run by the T.O.s." Her words are often halting, her sentences sometimes fragmentary and spare, uninflected, filled with "mmm-hmm" and "mmm-mmm" for yes and no. The reason became clear. Arleen's native language is a native language. Her English, whose sparseness contains archaic words like "naughty" or "a doings" (for a social event) that may be a legacy of missionaries, somehow seems not to fit right. "I don't know why I started talking English with my kids. Now my kids won't talk [O'odham]. They understand it, but they can't talk it." The tribe is not comfortably bilingual. The tribal newspaper The Runner published an article about the need for translators—"Applicants must speak O'odham and English"—in an upcoming election. Arleen herself is a transition figure. She was born "not even in a hospital" but in "a little adobe house," her parents' home in a town named Ajo, at the western reach of the reservation. An exhibit at the University of Arizona museum in Tucson includes a replica of a Tohono "adobe house of mud bricks." She seemed not quite of the present, either. At the cafe, several T.O.s—a chubby snack-buying boy who came in wearing his baseball cap backward, two elderly women in polyester dresses and tightly curled hair who chatted happily over lunch—appeared to be more contemporary than Arleen. So did a young Tohono woman, a Stanford alumna who ran a gift shop nearby and used words such as "awesome." During one of many puzzled linguistic pauses between Arleen and myself, I commented on the cafe's brightly colored Indian motif curtains. She said the boss's wife had made them. How nice, I chirped, glad for an easy subject. Arleen was unmoved by window treatment small talk. "Hopi design," she said flatly. Despite neither of us always understanding the other, she seemed willing and at times eager to talk, including about personal matters she later asked me to keep confidential. (I have omitted or changed many details of her life and have given her a pseudonym.) "I lived with my parents 'til I was in my teens. The way they are, you know, all teens get into being naughty and what not." For family reasons, she and her many siblings were sent to another site on the reservation to live with their grandparents when Arlene was about fourteen. What was she doing that was "naughty"? "Really nothing much. We were just trying to be outside playing at night, and our parents didn't want us to be out there." Her grandparents "talked to us about how we're supposed to be as we were growing up. It's like my grandma would tell us, 'This is how you'd fix...' when you cook something. She'd show us. That's how we learn. This is how we are right now; we know what to do. When you're off somewhere by yourself with a family, this is what you will be doing. By just looking at what she does, we learned it. And my uncles saying this and that, about how to be in life." She eluded my quest for examples. Arleen started her own family early. "I'm a high school graduate, but I never went anywhere after I got out of school, because I had my kids." Her first child was born when she was "about twenty-one, I think," and another came several years later. She now has two daughters and two sons as well as two grandchildren. "I did try to work, but I couldn't. So I knew once my children are grown up, I finally thought, well, I'm going to get out and do something. Whatever I can come up [with]. I was on [welfare], and then at one point when I was by myself—that is, when my husband wasn't here—I decided I'm going to go find me a job." She had, and still has, a small income from "things at home, like, I do arts and crafts. Basketry, crochet, beadwork. Sewing. But I wanted to do something that I could have money on the side for whatever I need, you know?" From her description, she does not seem to be an aggressive salesperson for her work, however. "Over at the church, there are usually some white ladies come in, and we have a little meeting, because they have a little women's organization. We say bring your arts and crafts, so we do. We sell it directly to whoever comes and [visits] our church." One of the most active members of the church (it is Presbyterian) and a force in Arleen's life is the wife of the cafe owner. The owner himself is from the Iroquois reservation in New York State. His wife is Tohono. In Sells, it is a mixed marriage. Long before Arleen worked at the Papago Cafe, the owner's wife invited her to join a church prayer group. "We have little prayer services here and there, at each [others'] homes." Arleen spoke of them earnestly. "That's how I learned, being a Christian, that you can come over things. Like a problem that you're trying to have. It's a feeling I guess you get to know, learning about the Lord." Arleen's early exposure to Christianity was to Catholicism ("we just take part in what they do"), which was the first missionary religion in the area. Rivalry between Catholics and Presbyterians caused enormous rifts in the tribe during the 1930s, sometimes splitting families,4 but she mentioned none of that. If I inferred correctly, Arleen prefers the Protestant faith because it allows her to unburden herself without a priest as intermediary. "You can confess it to God and say, hey...when you're by yourself." Her main spiritual advisor, however, seemed to be the boss's wife. "She encourages me about how the Lord is supposed to work in your life and everything." She also arranged Arleen's job. "She told me to come in and talk to her husband. I got the paperwork. I just came in that following Monday. I've been here ever since. I worked as being part of the kitchen, cooking and everything. Preparing plates. Later on he was asking me, 'Would you rather stay back here, or you want to go out and wait tables?' I said I think it would be better if I get out and walk, because I found myself, being in there...during the summer, I get these headaches. The heat's too much for me." Summer temperatures zoom past a hundred degrees, and, judging from the cafe's other fixtures, its cooling system may not be the most efficient. To Arleen, though, who often walks the mile-and-a-half route between home and work, movement mattered more. "I have to keep going, keep walking around." At the cafe, "my legs are too tired to be standing back there. What's good is me going back and forth, doing this. I've had [the job] for three years now." Her children "kind of missed me at one time, and it probably took them a while before they realized that I'm working." In Sells, a job is a precious commodity, but not one without cost. Arleen lost her benefits from Aid to Families with Dependent Children (AFDC). "Right now, I am just on what I work for." Her children are in a local health insurance program, but Arleen has no such coverage herself. Her waitress training was minimal. "I was told to say hello as you're putting out your menus and treat them nice. That's all I've been trying to do. Other times when I'm in a bad mood, I don't feel like I want to say that." People understand when "I'm not in a good mood." Some customers, she said with the trace of a frown, are "just picky people. They want you right then and there to bring whatever [they] need. Yet you have only got two hands. And you're waiting on other tables. You can't just leave and drop it. They have to wait until you serve them." The pickiest customers are older people, she noted. Others simply "like to talk, you know?" Arleen got close to giving herself a compliment: "I'm the kind of person where I look at myself as being kind to everybody. And I'm a soft-hearted person, I guess, when they complain." Almost all customers are Tohono O'odham. "Everybody knows each other around here." Sometimes, "I'm kind of jumping around." By "jumping around," she meant busy. "On one afternoon, me and [another waitress] shifted around our jobs. We rotated. I worked for her because I wanted to get off that afternoon. I just dreaded her job, because at noon this thing fills up." Then one man made a negative comment to someone about Arleen's work. "I didn't know what he said, and I didn't want to know." Her usual late afternoon to evening shift is "not as bad, but I enjoy it. And the tips I get [are] a help, because what I get from my pay is not as much." Asked how well people tip, she said, "I'm beginning to notice sometime back that some people that has good jobs, are well-off, they don't tip you nothing. Nothing. [Other] ones that come in, they do, no matter a quarter, fifty cents, or a dollar. I noticed, and I told my boss." He said he could have told her that the well-off ones do not tip well. There are exceptions. "From last night, some people said, 'Oh, I like your food,' and I got a five-dollar tip. Very seldom I'll get a five-dollar, even more. A whole bunch come in for a meeting, like the veterans? We just give them coffee. We're not supposed to charge them. But they all put in their dollars. It's like eight dollars for eight individuals." Asked about the Tohono chief, or chairman, she said evenly that he tips "all right." Once in a rare while, tourists come through the door. They create diversions of more than one kind. At the reservation town of Covered Wells, I watched an elderly Tohono couple make tortillas at their modest outdoor restaurant, while retirees in pastel slacks circled with cameras, calling out instructions about when to smile. The woman of the couple later told me she gets annoyed at such behavior but does not object out loud—it is part of the restaurant business in Covered Wells. Arleen claimed that picture-taking tourists did not disturb her. "Not really. If we have something like a doings next week, people come and take pictures or whatever." What the tourists may not realize, as they snap pictures of Arleen or stare at her striking looks, is that she gapes at them, too. "I'm amazed to see different ones come in, like from another side of the country. I enjoy talking to them, see. I say, well, I should have a book, let them sign that, and say, hey, I met this person from this [place]. There's still people I talk to at times. We get a conversation going and I go, 'Oh, I forgot I'm supposed to work.'" She came close to a laugh. Other tourists disconcerted her. "Just the other day, some ladies came in, and I swear, I thought, well, my boss did think that they were"—she leaned forward over the tablecloth and whispered—"lesbians." They came back day after day. The first time, Arleen fled to the kitchen and consulted with her boss. "I said, 'God, this lady stared at me.' I was telling my co-worker and she said, 'No, they're not.' My boss said, 'Yeah, I could tell right straight out. They are.' Of course, I got curious, and I had to ask them...," although she asked them not whether they were lesbians but where they came from. "They were from Austria, and they were out here doing some whatever, research. They kept coming in for three days. God, I felt so uncomfortable. They were the first people that made me uncomfortable." Relief finally followed. "These ladies came in and were telling [the boss] about going back home because they were worried about their family and their children. So he said, 'Wow, they're not like that.'" Arleen seemed blind to the reason that anyone, much less Austrians, would stare at her. Some local customers can make her uncomfortable for entirely another reason: they walk in the cafe drunk. They may simply stand around and order nothing. "We let them, and then they take off." Others eat. "We can't refuse services to anybody unless [they cause a problem]." Only one group misbehaved, "but I think they got picked up. I don't think they paid [for] what they ate." She brought up the subject of alcoholism, as she folded and refolded a piece of paper at the window, the sun on her shoulder. "It's killing our people, alcohol, right now." She spoke about its effect on her own family but indicated that she has been free of the problem herself. "I tried it, but I didn't care for it. I won't. Up to now I just don't. And I'm trying to discourage my kids from that, because it's better to be sober than be in that." As Arleen mentioned one of her grandfathers drinking, a new sound, perhaps just the back door squeaking from a gust of wind, came into the cafe. That instant, she sat up straighter, cocked her head a fraction toward the sound, and stayed utterly motionless for several seconds. Ludicrous as it sounds, in those seconds before she relaxed (it was not the boss after all), I saw her in the Tohono desert landscape a millennium ago, standing stone still after hearing a twig snap. I shook myself back to plastic tablecloths, Hopi curtains, and Arleen of the present, whom I did not want to embarrass with foolishness. She was speaking of how the modern curse of drinking puts children "through a lot. Things go on in the household. That's why the kids are the way they are right now." The Papago Cafe serves no alcohol, part of an attempt to keep the curse off the reservation. "They're not licensed for liquor here, but we have bootleggers a lot." Arleen Garcia also was concerned about her own future, as it related to the cafe and her life. She began to speak in unexpectedly intimate detail about her current circumstances and a decision about getting back together with a certain man. It was obvious she cared for him. They met "somewhere at a place that had a doings." She smiled as she reminisced, until mentioning that when he gets a job, he might want her to quit hers. It was obvious, too, that she does not want to give up financial independence. She likes where she works, mostly. She gets along with her employer ("he's an all right boss"), although she does not like that he swears. "Because I don't talk like that. I don't want to change jobs. But if this place was closed down, I might need to start looking for something else. Somebody's offering me a job, trying to say come to the casino." There is a long and benevolent tradition of gambling (part of a means of making scarcity seem like abundance) among the Tohono O'odham,6 but the T.O.s Desert Diamond casino south of Tucson marks a departure from that tradition. Inside a domed complex is a stretch of low lighting, the thickest cigarette smoke imaginable, rows of engaged slot machines, and continuous clangor: triple rows coming up, one-armed-bandit handles going down, clanky-toned payoffs, occasional screams of glee. Through the aisles, the women of the Tohono O'odham Nation, many with their straight black hair frizzed into coiffures of foreign tribes, push money change carts like ice cream dispensers. Conversation is all but impossible, but one money changer shouted to me, after I shouted to her of Arleen's notion of working here, "You have to be sociable." I shouted, "She seems shy to me." She shouted back, "She won't be shy long." At the cafe in Sells, I asked Arleen what she would like to happen in her life. As usual, she spoke softly. "I don't know. I just live a normal life. I'm thankful for what I get, even though it's not much. Yet I know I want more—if I was to have another job and get more pay, you know?" But "it's hard for me to leave this, because I've been so in it." She looked around her, and then she proved that, in one respect, belief in prayer has not changed for the Tohono O'odham. "Being that my boss's wife is a Christian lady, when I joined that [church] group, at the end we'd say what we would ask for, a prayer. My request was, 'I want a job. I'm looking for a job. I'm praying for a job that I would some day have. I don't know what, but I want something.' My next time, later on, my prayers were answered." On February 1, 1960, in Greensboro, North Carolina, four teenage male students from a local college went downtown, entered the Woolworth's department store, bought a few items, walked over to the store's sizable and popular lunch area, and sat down at a counter. They assumed that the waitress who came over would say she could not serve them. She was white, they were black, and they were right. Then they said they would not leave. That precise moment, at those four padded vinyl stools with metal tube backs along that long, cool counter, would take on enormous significance in the civil rights movement. It was the beginning of the first southern sit-in. Ima Jean Edwards, who had been a Woolworth's waitress for seven years, was working at the combined bakery counter and snack bar a few yards away. "They came in that afternoon, late in the afternoon, and asked to be served. And of course at that time nobody in the South served a black person at the counter or otherwise. You might serve 'em in the kitchen, but you didn't serve them up at the counter with the other people." By "up at the counter," Ima Jean did not mean her counter, where she served food to customers, black and white, who ate right there, standing up. No one objected to Woolworth's customers integrating themselves by eating while standing? "No." That February day, co-workers later told her, the students ordered a piece of apple pie.7 "The waitress who waited on them told them, 'I'm sorry, but I can't serve you.'" A manager stepped in. "They wouldn't move when the management asked them. They told them then they would be back the next day." Ima Jean was among the employees who believed the students. "Some had said, 'Oh, no, they won't be back'; but they had definitely told us they would be." While the sit-in began—"I knew it was going on"—she stayed at her counter, working. She had no need to get close to hear what management would say. "It really wasn't a definite policy, because it was ev-er-y-where. Nobody served a black person with the white people. It was the code of the South." Ima Jean Edwards did not feel poised on the brink of history. "At the time, I didn't think much would come of it." Then again, she had been raised with lowered expectations. A native North Carolinian, she grew up the eldest of six children on a small farm of meager output. Asked about her childhood, she said without inflection that it had been "really hard." If misfortune comes in threes, Ima Jean's first might have been poverty. The second came when she was eight. Carrying her baby sister to the post office while their parents were in the fields, Ima Jean collapsed, one leg buckling. It was polio. During a long convalescence at home, "I had to lay there with sand bags to my arm and my leg, to keep it from going crooked." The third blow came a couple of years later. Her father went to a chiropractor for a treatment and suddenly lost his memory. Diagnosed as insane, he was put in a mental hospital. "For four years, he did not know who we were, at all." The children who were old enough to work helped their mother keep the family's few farm animals fed and the corn and tobacco fields producing. 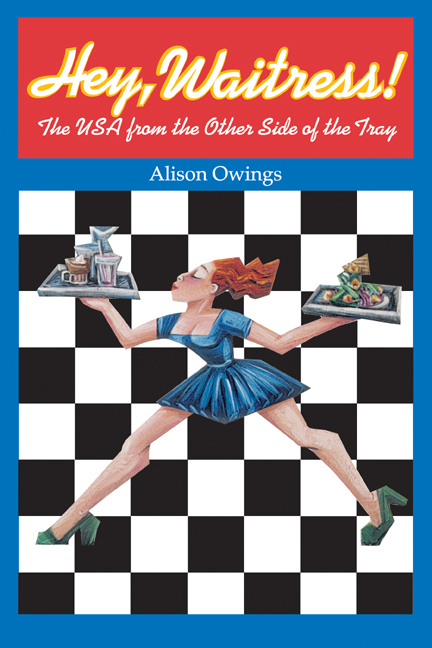 Most of us have sat across the tray from a waitress, but how many of us know what really is going on from her side? Hey, Waitress! aims to tell us. Containing lively, personal portraits of waitresses from many different walks of life, this book is the first of its kind to show the intimate, illuminating, and often shocking behind-the-scenes stories of waitresses' daily shifts and daily lives. Alison Owings traveled the country—from border to border and coast to coast—to hear firsthand what waitresses think about their lives, their work, and their world. Part journalism and part oral history, Hey, Waitress! introduces an eclectic cast of characters: a ninety-five-year-old Baltimore woman who may have been the oldest living waitress, a Staten Island firebrand laboring at a Pizza Hut, a well-to-do runaway housewife, a Native American proud of her financial independence, a college student loving her diner more than her studies, a Cajun grandmother of twenty-two, and many others. The book also offers vivid slices of American history. The stories describe the famous sit-in at the Woolworth's counter in Greensboro, North Carolina, which helped spark the civil rights movement; early struggles for waitress unions; and battles against sexually discriminatory hiring in restaurants. A superb and accessible means of breaking down stereotypes, this book reveals American waitresses in all their complexity and individuality, and will surely change the way we order, tip, and, most of all, behave in restaurants. Alison Owings is a freelance writer and the author of Frauen: German Women Recall the Third Reich (1993).